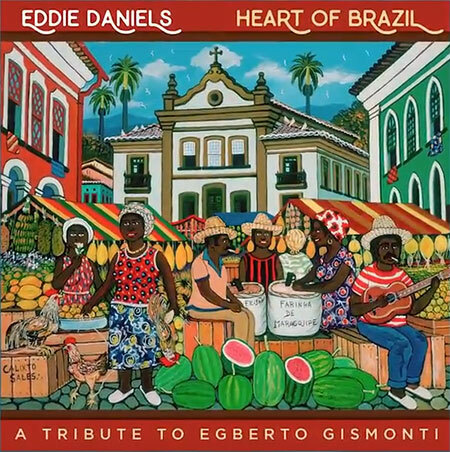 A virtuoso on both guitar and piano, Egberto Gismonti has created a body of work that stand at the crossroads of his native Brazil’s folk tradition and the world of classical music, in a way which echoes his predecessor Heitor Villa-Lobos. He is also a masterful improviser. 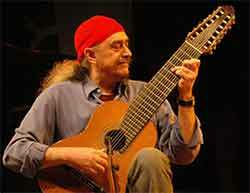 Gismonti has been described as approaching the fretboard as though it were a keyboard, often creating the impression of more than one player. His blazing technique is capable of summoning up an almost orchestral palette of colours. Gismonti was born into a musical family in Carmo (Rio de Janeiro state) in 1947. After first studying the piano, he took up the guitar in his teens. He went on to study composition, orchestration and analysis in Paris under Webern’s pupil, Jean Barraqué, and the legendary Nadia Boulanger. On his last day as Boulanger’s student, she told him to “be a little irresponsible in [his] music, just trust and break the rules”. A critical stage in his development was his encounter with the indigenous peoples of the Amazon rain forest and their music: his researches, and human encounters, changed his view of the expressive possibilities of musical language and continue to fertilise his work to this day.